I really liked the Noriko Handbag from Lazy Girl Designs that Bunny of La Sewista made, so I hopped on over to the Lazy Girl Website and downloaded the free pattern. I cut down the pattern an inch all around, and made the straps a bit shorter. Notice the fabric? It's leftover from the Christmas Dress in the last post. Like the kitty button? I made the tab with velcro for little fingers to handle more easily. This is some leftover butterfly fabric I had, with the bag made at the original size. This is a very cute bag and extremely easy to make. Thanks to the Lazy Girl for the free pattern. Check out the website for more fun purse, accessories, and quilt patterns. It is raining again here in Southern California, but at least there is no snow! I hope all of my friends in New England have dug themselves out by now, that was a pretty nasty blizzard. Luckily my son, who attends school in Connecticut, is home. The granddaughter has decided to bring her parents over today, not tomorrow, so I'll be signing off until after the New Year. Take care and have a Happy New Year! Not hardly for me! Our granddaughter doesn't show up with her Mom and Dad until Thursday, so that's when we will have Christmas Dinner II. But I did finish the red Christmas Dress on the day after Christmas. I like the way the crocheted edging came out. It's just the right weight for the fabric. I will try very hard to get a nice picture of her in it standing in front of the Christmas tree. The pattern is Maggie from Children's Corner, one of their fairly old ones. In fact, it is labeled as #1 Maggie Daydress, so maybe it's their first pattern? While I like the look of the dress, I didn't care for the pattern itself. The directions are a bit spotty, with extremely long sleeves that had to be shortened. The dress itself is quite short, so I lengthened it a good three inches. The pattern has you smocking only a short block, then gathering the fabric above the smocking to sew into the shoulder seams and collar in the back. I thought that was a bit odd so I smocked all the way to the top of the fabric pieces. The trouble is, the smocking in the back makes the collar seam sit straight up, and not fold down as it should. The front placket directions were very hard to follow, so I had to wing it. As a result, my buttons are a bit off center, bit I think I can adjust them a bit. I probably will not make this pattern again. Since Christmas isn't over for me, I still have to wrap presents. Last year I came across an article about making fabric Christmas bags to use instead of wrapping paper. I won't show a tutorial, as it is really too easy to do. All you have to do is fold a long piece of fabric, right sides together, sew the side seams, then turn right side out and hem the top. Add a length of ribbon to the side and you have a Christmas gift bag. A nice present all wrapped and ready to give! You can loop a gift tag through the ribbon or use a stick-on label on the fabric itself - but they tend to fall off easily. What I would like to do is figure out how to make reusable gift tags, but as it is, we have enough for several more years. Best of all, there is practically no trash on Christmas morning. The men in my family love this as they all hate to wrap! Christmas fabric is on sale right now, so make up some bags for next year! You'll love them. 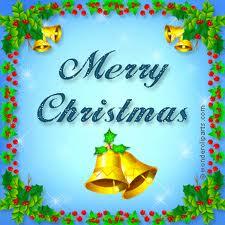 I hope all of you have a wonderful Christmas, full of peace and joy for you and your families. The packages are all wrapped, now it's time to make Christmas Eve dinner. Later we'll set out cookies and Grand Marnier for Santa. My dad started this tradition but always insisted that Santa prefer a good cognac over milk, to help keep him warm. This somehow morphed into Grand Marnier, but we think Santa likes it just the same. Christmas chores are getting to me this year and I am falling fearfully behind! But doesn't that happen to many of us? But this post is all about what to make in Christmases yet to come. I'm linking up with Laurie Anderson's Linky Party again, this one about the Spirit of Christmas future. I prefer "yet to come" as that is what is used in Dickens' A Christmas Carol. I just finished listening to an excellent recording of the book by Tim Curry (of Rocky Horror fame, no less) which was a freebie that came with my Audible account from last year. I bought this cute kit of gift card holder ornaments thinking I could get them made up for the various Borders, iTunes, and other gift cards we give our children each year. But as you can see by the very neat kit still in the bag, it hasn't been touched. So maybe next year. These are die cut Christmas shapes I bought with no clear idea of what to do with them. I thought that maybe I could use them as gift tags, but that red and green, not to mention the gingerbread color, will be somewhat hard to write on. The angel shape gave me the idea of making a cute embroidered felt angel ornament, but that didn't get done either. Sigh! Now this one I bought with every intention of keeping it for the future. This is a kit by Jenny McWhinney, who specializes in needle painting, very often with wool threads. I made a darling stocking for my granddaughter last year from one of Jenny's patterns, and if my daughter remembers to bring it with her I'll photograph it and share it with you. I bought this kit hoping for a second grandbaby! There are several other projects that are left for the future, including more than a few Advent calendars and some Christmas lap quilts. But those are subjects for future posts. Are you getting any Christmas sewing/baking/etc, done? Tricia Wilson Nguyen of Thistle Threads specializes in Historical Embroidery, and recently conducted a Jacket Tour in the UK, inspired by the Plimoth Jacket project she has been working on for several years now. While at the Fashion Museum in Bath, she found a wonderful collection of gloves that need to have storage boxes and stands purchased to better display and store the collection. 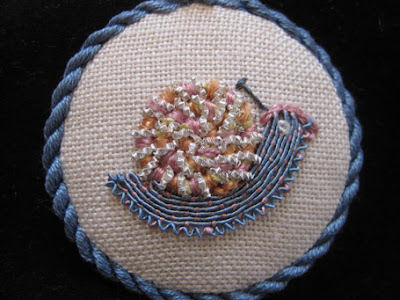 So she has put together a new Needlework Nibble of a snail inspired by one of the gloves. You can read about this project on her latest blog entry. She will donate $7.50 of each kit cost to the museum, and has already sold two thirds of the 125 kits already made up. She has materials for more, but when she runs out, the kit probably won't be available. I've already ordered mine and hope to work it soon! I have already made one of her Needlework Nibbles, The Gilded Grapes, that I posted about back in June. These little kits are great for trying out new techniques and materials, and make great scissors fobs, little box covers, or even lovely pattern weights. I made a pincushion out of the grapes, and while I use it, I make sure not to poke needles and pins through the grapes. Most of the kits for the other Needlework Nibbles are sold out, but she has several other kits for sale. Please visit her site to see the gloves and the stands with storage boxes. Laurie Anderson, of SewNSo's Sewing Journal is having a Linky Party each Monday in December before Christmas. The first, Spirit of Christmas Past, was last Monday and was about, oddly enough, what handmade items we've made in the past. Click on the link and you can see the lovely dresses Laurie has made. Today's post is about the Spirit of Christmas Present, so I'll post about the red dress I'm making for my granddaughter. Laurie created a cute badge for those of us who link to her post to put on our blogs, but I can't get the darn thing to work! So please click on the link to get to her party, and be sure to follow all the other links for some fun posts! and the fronts. The embroidery doesn't stand out that much as I did want the effect to be subtle and not scream "Christmas". and the cuffs - all in black. I'm sure you are all thinking, "How clever! How original!" No way, I got it from the November-December 2010 issue of Sew Beautiful, and saw it some years ago in AS&E, Issue 66. It would have looked pretty bad with white entredeux and black crocheting, so I made the entredeux. The placket is pretty long and is going to take a verrrrryy long time. I should get quite a bit done as I'm staying home today - the Geek Squad is coming to set up our new home theater! You can be sure I'm doing my part to help the economy! I know, I need to wash the ironing pad. Now, back to the crocheting. Here is another post in the Spirit of Christmas Past. We are getting out the Christmas decorations and setting up the tree today so I'll share some angels that I made several years ago. This is a tree topper which originally had an awful bright white polyester dress on it. My sister, who makes wedding gowns, gave me the silk charmeuse scraps from her daughter's wedding dress. I made this little dress using a Wee Care pattern from the SAGA website, making the sleeves a bit longer and trimming with lace. I added lace on the top to make a ruff and gathered it instead of smocking it. I didn't want the experience of trying to run the silk charmeuse through the pleater. I used lace beading to gather the neck and sleeves. This is a scrap of lace beading for those of you not familiar with it. Attach it to fabric and other laces by a tiny zig zag stitch and thread narrow ribbon through the holes to gather. Some simple feather stitching and bullion roses using silk embroidery floss, YLI, I think. And here she is with her attendants. Her wings are from Macy's Christmas Shop years ago and pinned to the dress for easy removal. The little angels are cotton batiste with the decorative stitches from my sewing machine. The pattern is from Creative Needle Christmas, published by the now defunct Creative Needle Magazine back in 1997. It has been out of print for some time but is available it from various sellers on Amazon for as little as $0.99 plus shipping. I must have made close to twenty of these and gave many away to nieces and the ladies at work. They make a really nice and easy decoration. Just use lots of starch to keep them upright. Are you getting out the Christmas decorations? Have a great Saturday! I have finished the smocking on the Christmas Dress for my granddaughter and am starting in on the embroidery. In the last post, Bunny mentioned in the comments that it would be a tough job of picking out the right colors for the roses. Was she ever right! It seems that I stared at that DMC color card for hours before I finally got to where I could pick out something to try. I tried a few different color combinations for the bullion roses to go in the center columns of the smocking. Bullion roses are generally made with three colors with the darkest in the center and the lightest on the outside. I didn't want to use black for the center, as that would be too artificial looking, so I tried using the darkest portion of the DMC variegated floss 115, and a fairly light red/pink color for the outer petals. I made the decision to use the same color for the center petals as I used for the red smocking. I thought the contrast was too great between the lightest and darkest colors, as shown in the two roses in the center of the above photo. There are four altogether, can you see them? Look at the one on the right, it has a slightly darker shade for the outer petals, which I like much better. I finally settled on the combo on the left, which has a lighter color for the darkest inner petals. The colors are, dark to light, 304, 321, 3801. It does seem to blend in with the fabric, but I want subtlety in the roses, not great contrast. I decided to outline the smocking in black, to match the trim on the collar and cuffs that I showed you earlier. This is the back panel, and has two partially completed roses on it. I need to add the lightest color for the outer petals, but it's getting late and I have already ripped out several attempts. I have that nagging feeling that if I keep working on it now I'll regret it later. So I'll put it aside for something a bit easier, and come back to it when I feel ready to tackle it. This is my link up to Laurie Anderson's Monday Memories Series of Posts, the first of which is Spirit of Christmas Past. I really didn't sew that much for my children when they were young as I was so busy working, so this is about the very recent past. I made this dress two years ago for my niece, Claudia, from a kit I had purchased some time earlier. The pattern originally called for picture smocking on the insert but I changed it to a geometric design which I found much easier. I even made the piping to go on the smocked insert, collar and cuffs. I managed to match the floss pretty well to the dress, don't you think? Claudia loved the dress and was able to wear it for two Christmases. I made it fairly long and she only grew up, not out very much. I made this from the standard smocked yoke dress pattern available in the various issues of Australian Smocking and Embroidery. The construction is fairly easy for an intermediate sewer, as there are no really special techniques to use. I interfaced the yoke, which made it way too stiff - I won't do that again. Laurie made a cute little badge to put on my site, but I can't get it to work, so use the link at the top of her page to see all the various posts. Happy Christmas Sewing - I have to get back to my current project! It's been a hectic week at work and as a result, I have spent very little time in the sewing room. Very frustrating. I did manage to pleat the front and back pieces, to get them ready to smock. I pleated each half row and the pattern is fairly detailed. Notice I pleated all the way to the top of the fabric pieces. I'm sure you're thinking, now what is unusual about that? In this closeup of the pattern illustration you can see the smocking placement on the front. It doesn't go all the way up to the top of the pattern piece, and the instructions have the sewer gather the top section above the smocking. I think this is a fairly old pattern, as the pieces have the dots marked on them for smocking, with no references to pleaters. So I pleated all the way up to the top so I wouldn't have to gather it separately. I have found that when having to gather large amounts of fabric, running it through the pleater with only two pleating threads does a marvelous job of gathering the fabric very easily. The smocking plate that I am modifying for the dress is from Australian Smocking and Embroidery No. 54, from 2001. The dress is "Cupcake" and I've wanted to make it for a long time. I may still someday. Unfortunately, this issue is no longer available, and a quick search of Country Bumpkin, eBay and Amazon turned up no issues. The right front smocked with matching red thread. The white thread at the top is a tailor's tack that I use for marking the center valley. It's much more reliable than white chalk and very easily removed. And the back panel smocked. This pattern needs some serious backsmocking to keep the center panels from pulling away from the smocking. I think I'll do the edge smocking in black or a darker red, then figure out what to do in the center. Bullion roses, of course, I just have to pick out the right pink and red combination. In a previous post I showed you what I had intended for a Christmas dress for my granddaughter. Sadly, my extremely poor picture smocking skill are showing forth. The smocking plate showed Santa with three reindeer flying over trees and houses. It's an adorable pattern, but I just am not experienced enough in picture smocking. This is far as I got before deciding that I would just not be able to make this look good enough to claim that I did it. The trees are too squat, and the houses definitely look different - but they are not supposed to. I think that the pleated fabric was not tight enough. I blocked it to the pattern, but the pleats were too far apart to really be able to make the smocking look good. So back I went into my pattern archives and came up with Maggie from The Children's Corner. I am making the long sleeved version in the same red fabric as before, but with a few changes. First of all, no lace. I just don't think lace would look good with the fabric, which is a quilting weight cotton. The cuffs are turned up and hemmed, and I wanted some trim on the outer edge, so I made them two piece. Then I decided I needed black entredeux, which is a ladder stitched onto fabric strips and is used to attach lace and other embroideries to fabric. Naturally, I couldn't find any online, but I remembered seeing directions for making your own somewhere on line. I couldn't find the link, but was pretty sure that I saw it on Laurie Anderson's blog, SewNso's Sewing Journal. After rifling through her website for a while and not finding it, I emailed her, and she responded with the link in half an hour. Thanks, Laurie! I made about three yards of it with black cotton fabric from Joann's, Mettler No. 50 cotton thread, a size 100 wing needle and some black tear away interfacing I just happened to have from a sampler pack. I have a Husqvarna Designer I sewing machine, and I used stitch D7, Venetian hem stitch, with the factory settings of L=2.5 and W=3.0. Then I went to work on the dress. I think the dress in the pattern is much too short, so I made it six inches longer so it will be below her knees and have a generous hem. This is the top and bottom of the collar, which is in one piece as the dress buttons in the front. Dresses that button in the back usually have two piece collars that meet in the front. I won't cut out the center portion of the collar until it is sewn together and ready to be attached to the dress. This keeps it from being distorted while handling. Here is the collar sewn together, turned right side out, with the entredeux trimmed and clipped, all ready to go. I also worked on the sleeves a bit. Since I'm putting in a french seam, I first sewed the wrong sides together. Here is it pinned and ready to be sewn. Next I pressed the seams, turned the sleeve outside in, then sewed the sleeve right sides together, enclosing the seam. Perfect french seam, with the cuff hemmed in place. I'm sure you're wondering about the black entredeux, but I'll post about that in a later date. Next up, the pleated front and back. Here is another little outfit I made for my granddaughter and is now back in my keeping, waiting for the next one (if ever). This is a feather stitched baby jacket with a matching diaper cover. We made this in a SAGA class hosted by one of our local chapters, designed and taught by Kathy Awender, who I've mentioned before. The fabric is a poly/cotton pique which at first I didn't like, but have come to appreciate. It doesn't wrinkle they way 100% cotton does and it's pretty darn easy to iron. The smocking is a feather stitch, which is worked from right to left, unlike most stitches which are worked left to right. You can find detailed instructions for several different varieties of feather stitch in Country Bumpkin's A to Z of Smocking, available on their website, Amazon, Book Depository and many other retailers. The collar, cuffs and smocking all have matching pink piping which we made ourselves. It's pretty easy once you get the hang of it. Notice the extra feather stitching on the collar and cuffs. It wasn't in the original design, but I always add extra. The flower embroider is simple, but very sweet. The flower is a buttonhole stitch worked in the round, and the leaves are fly stitch. This was all fairly easy, and makes a great project to make in a day or two. I used a pattern I dug out of an old Australian Smocking and Embroidery for the diaper cover. I hope everyone had a lovely Thanksgiving. We only had my mom over, so it was a quiet holiday. I learned that you don't have to have 20+ people to have a good Thanksgiving! She went home with the green afghan, as it's been cold here, for Southern California, and it is nice and cozy. My Christmas sewing has not been going well, but is recovering. I'll have a post about it soon. My daughter in Colorado has recently sent me several boxes of outgrown baby clothes for storage, so I've been rummaging through them to find any of the items I've made. This is from Best Embroidered Baby Clothes One, a pattern by Jeannie Baumeister of Old Fashioned Baby. It is made from pink cotton batiste and ecru lace. The design is slightly my own. I've taken design elements from Jeannie's patterns and arranged them a bit differently. The tucks are hand sewn, which gives them a nice, soft look. After I made it, I realized that if my daughter has another girl, I hope her name begins with a B so she can wear the dress. The initial is shadow work, and all embroidery is done with ecru DMC floss. The flowers are bullions made into a detached chain. There is lots of featherstitching, with French knots for variety. I attached the lace with point de Paris, or pin stitch, all done by hand. Instead of cutting away the fabric behind the lace, I left it on. Jeannie does this with a lot of her dresses, and I really like the look of it. It's also much quicker than cutting the fabric, then rolling and whipping it to secure it. The actual construction of the dress is by machine, including attaching the lace to the neckline, sleeves and hem. I also made a slip, with some simple embroidery on the front. The neckline and armholes are hand stitched with a shell hem. So how on earth can the photos of the slip be so different from the dress? I took them at the same time in the same place. Grrrr. And here is a blurry photo of Bridget wearing the dress. As I've mentioned before, my daughter inherited her photo skills from her mom. I really like this pattern, as I like all of Jeannie's patterns. Her style is very sweet, dainty and cute. You can add as much or as little lace as desired. Her embroidery is fairly simple, but appropriate for a baby dress. I generally tend to add more featherstitching, as I love it on baby clothes. There is nothing I don't like about this, except that using fine cotton batiste makes it a bit difficult to iron. This can be a stumbling block for young moms who don't have the time for ironing, and grandma lives too far away to do it for them. I'll write about other dresses I've made as I find them.